A small business owner (The Deoc Ensemble, a string ensemble for weddings and special events) and a teacher, Grace wants to bring her passion for supporting the underprivileged and underserved in our community to help her FAC through the grant process. Her dream philanthropic project would be to provide meal kits (think “Hello Fresh” or “Blue Apron”) at no or little cost to families who live in food deserts. This would not only help solve the on-going debate of food stamps, but could be a step toward nutrition education that would provide lifelong healthy habits for people in need. She is very grateful to Impact 100 for this opportunity to make a difference in our community! Samantha is passionate about the nonprofit sector with ten years of experience working for nonprofits, most recently at The West Foundation. She felt her experience would allow to bring a bird’s eye view of the nonprofit sector and an understanding of philanthropic best practices to her Focus Area Committee (FAC). When asked about her dream philanthropic project, she described an executive coaching and leadership development program for emerging female leaders in the nonprofit world, with the goal of equipping female leaders with the network, resources, and tools to overcome barriers to career advancement. Looking forward to building on her foundation of serving others within Marion County and surrounding areas, Deondra is eager to sit on a FAC with like-minded individuals who share her passion for giving back and serving others. She currently serves on the Board of Directors for Bloom Project (a nonprofit dedication to mentoring young males and providing them with the tools to prepare for secondary education) and is employed by Goodwill Industries. Deondra’s dream philanthropic project would be a financial literacy program to help young adults develop the knowledge of personal finances, including the importance of budgeting and saving for the future. Her hopes would be that this nonprofit would come with an initial monetary investment for each participant. Alexis, who is currently attending the IU Lilly Family School of Philanthropy, included information about China’s Ming Dynasty and their benevolent societies. These organizations were essentially giving circles used to see to the needs of those who needed help. 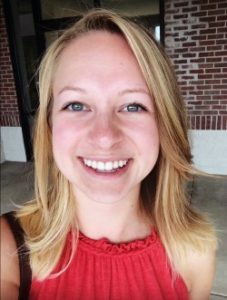 Currently a graduate assistant at the Hoosier Environmental Council, Alexis wants to create a self-sustaining hybrid project focused on environmental sustainability and creative development to manufacture and create organic materials to be used for unique art that is ethically sourced. That’s a dream project combining our Arts & Culture and Environment FACs. This entry was posted in Announcements, Member Feature, Scholarship on May 19, 2018 by Impact 100 Indy.